In our last post, we studied how early gunpowder factories were often located in the middle of towns in the early days of firearms. Of course, placing a factory within your town walls made sense if you wanted to defend your town walls against attack, but there was the problem of accidents in the factory setting the town on fire. Towards the beginning of the nineteenth century, people began to think more about factory safety and several laws were passed specifying how far away a gunpowder factory could be away from people's houses and how much powder could be worked inside one building and so on. In today's post, we will study how one such factory was set up in the 1860s. Today's object of study will be the Confederate Powder Works. Not much remains of the Confederate Powder Works these days, except for one 150-foot tall chimney, but in its day, it was a massive factory complex laid out over two miles in length and was the second largest gunpowder factory in the world then. During the days leading up to the Civil War, the Confederate states did not have any significant gunpowder manufacturing facilties, except for a small mill in Tennessee. On July 10th, 1861, Confederate President Jefferson Davis authorized Major George Washington Rains to build whatever was necessary to keep the Confederate armies supplied with gunpowder. Colonel George.W. Rains. Click on the image to enlarge. This photograph was taken during the Civil War and is currently in the Augusta Museum of History. It was centrally located and near the junction of some major railroads. The area was near enough to a big town (Augusta) to provide sufficient workers and materials. It was far enough from the front-lines that Union forces could not easily attack it. The Augusta canal and the Savannah river could also be used to transport over water. The Augusta canal was also a source of water power, which is useful to drive factory machinery. The area has temperate weather, which means the water supply does not generally freeze during the winter months, thereby ensuring unlimited water power during the whole year. Since he also intended to produce pure potassium nitrate (saltpeter) in the factory, he also needed abundance of water to wash and refine the minerals. The canal could also be used to transport supplies and materials from one factory building to the next. However, Rains had a few big problems: First, he had no idea about how to build a gunpowder factory, having never been inside one before! Luckily, he came across a book authored by a Major Fraser Baddeley of the Royal Artillery in England, called "Manufacture of Gunpowder as carried out at the Government Factory, Waltham Abbey", that described the entire process and machinery used by the Royal Gunpowder Factory at the Waltham Abbey works in Essex, England. While the book had the descriptions, there were no drawings or plans of the buildings or machines, therefore he had to research on his own to figure these out. Luckily for him, he happened to find an Englishman named Frederick Wright, who had moved to the Southern states and had worked at Waltham Abbey previously, so he asked him for assistance and produced some detailed word descriptions and preliminary sketches. The next problem was to find an experienced architect to build the plant while he was occupied with other duties for supplying the existing armies in the field. He hired a couple of young civil engineers/architects, Miller Grant and Charles Shaler Smith to do the job. Construction of the first building started in September 1861. By the time the factory was in full operation, 26 separate buildings were constructed over 140 acres of land that extended almost two miles along the banks of the canal. The buildings were constructed along the canal, coinciding with the process of making black powder (i.e.) the warehouses to store the raw materials were located first in line, the refinery to refine saltpeter was next and so on, until the final building at the end of the complex, which was used to store the finished gunpowder. The canal was used to transport materials from one building to the next, much like a modern assembly line. The most important buildings were built first: the Refinery, the Incorporating mills, the Mixing house, the Granulating house, the Pressing house and the Drying house and the Boiler house. Other buildings include a blacksmith's house, the stables, a carriage house, a laboratory etc. We will discuss the construction and use of these buildings in the next post or two. The refinery building in particular, was very beautiful to look at, being constructed in a Gothic revival style, influenced by the Smithsonian Institution in Washington DC and the British Houses of Parliament. 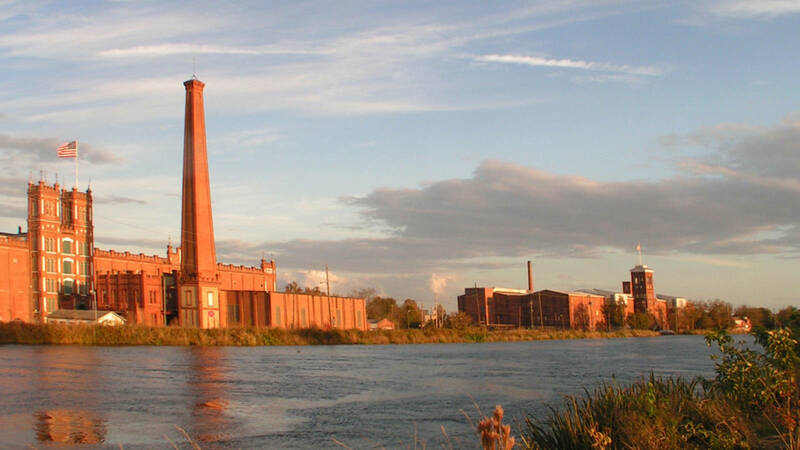 The chimney in front of the refinery was shaped like an obelisk and is the only structure that survives today, located at 1717 Goodrich Street in Augusta. The buildings were separated from each other and designed to survive explosions, in accordance with the safety procedures used in other gunpowder factories in the 19th century. The first gunpowder in the factory was made on April 13th, 1862; just nine months after Rains had been authorized to build the factory and construction of new buildings continued as the factory expanded. The factory remained in operation until the surrender of the South during the end of April 1865, which means it remained in operation for a little over three years. During this time, it managed to produce approximately 2,750,000 pounds of gunpowder at an average rate of around 7,000 pounds a day. In addition to this, the factory also produced other war material, such as time fuses, artillery pieces, wagons etc. Due to his efforts in building the factory, Major Rains was promoted to a full colonel by the end of the war. After the Civil war ended, the factory fell into ruin. In 1872, a project to widen the Augusta canal resulted in most of the buildings to be destroyed, leaving only the tall chimney that can still be seen today. The chimney was spared, at the request of Colonel Rains, as a memorial to those who died in the Southern armies during the Civil war. A view of the chimney as it exists today, courtesy the Augusta Historical Society. In 1880, a new mill was constructed in the old powder works area, called the Sibley cotton mill owned by the Sibley family. Bricks from the demolished buildings were used to construct the new mill and it was built with the appearance of a medieval castle or fortress, similar to the powder works buildings that it replaced. The cotton mill was very successful and remained in operation until around 2006, making denim cloth for major clothing manufacturers. While the mill production has ended, the water-driven turbines still remain in operation and generate electricity that is sold to Georgia Power even today.